⚡Israeli Prime Minister Benjamin Netanyahu will cut short a trip to Washington after a rocket fired from Gaza injured at least seven people and damaged a house in central Israel, Barak Ravid reports for Axios. Now, it’s time for victory dances — and vengeance. 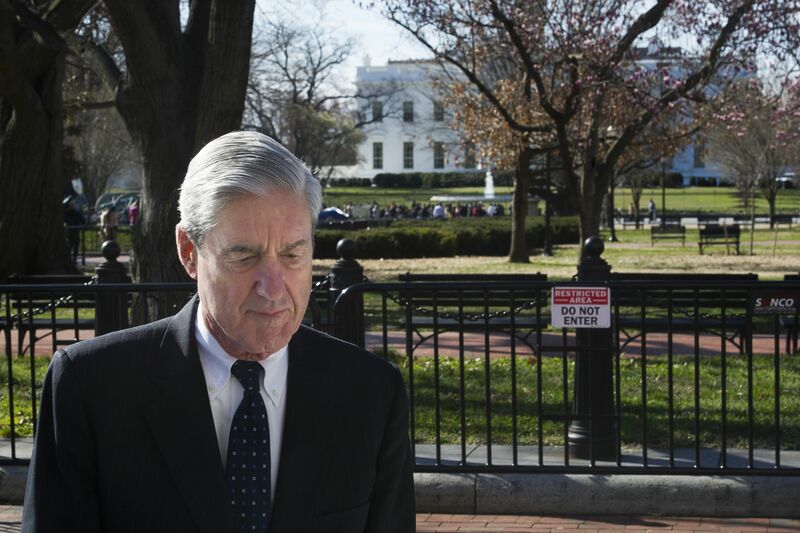 The one-two gut punch to his critics — first, beating Hillary Clinton, and now, vindication from Robert Mueller — won't just define his first term in office. It'll shape and sharpen his argument for re-election — and his war against the anti-Trump media. Those generated 245 million interactions (likes, comments and shares) on Twitter and Facebook. Be smart: Now, think of how much cable time the coverage consumed. Now, the speaker must stare down members, donors and activists hell-bent on administering some Trump punishment, even after Mueller took a pass. 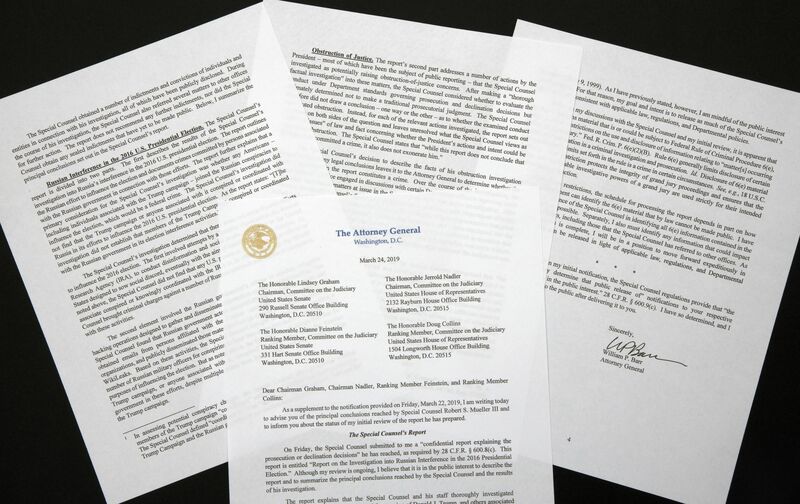 "Our primary focus is on getting the underlying documents," a Pelosi aide said. "We think there's a lot there that helps inform these other investigations." National Review's Rich Lowry tweeted "Hats off " to The Intercept's Glenn Greenwald and The Nation's Katrina vandenHeuvel "for consistently pushing back on the insanity on their own side on Russia collusion for the last 2 years." 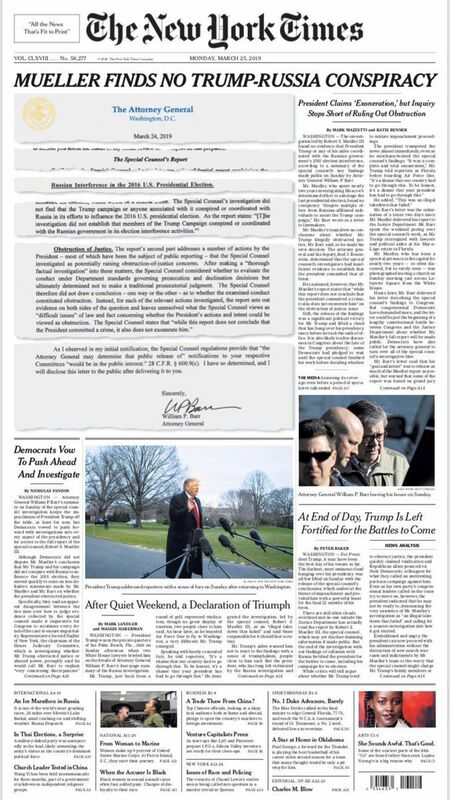 "Mueller ... appears to have created a substantial record of the president’s troubling interactions with law enforcement for adjudication in noncriminal proceedings — which is to say in congressional hearings that are surely the next step." 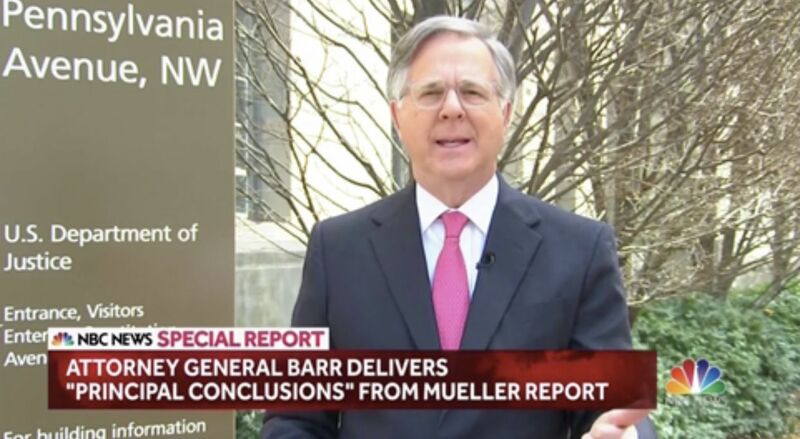 "[T]he document ... offers only a skeletal description of Mueller’s report. 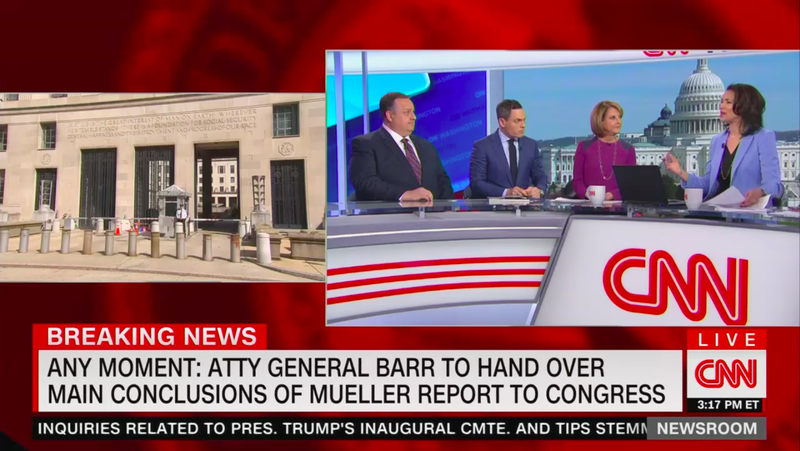 It only purports to convey Mueller’s top-line findings and does not include any of the evidence or legal analysis that underlies those findings." "[I]t is important not to lose sight of the significance of the investigation having been completed. That Mueller was able to complete his probe into a sitting president without having his investigation blocked ... is no small thing." Ruined landscape tells of a fierce fight in final ISIS stronghold ... On Saturday, this was the destruction inside the final encampment held by ISIS in Baghouz, Syria. This weekend, U.S.-backed forces declared victory over the Islamic State after liberating the last pocket of territory held by the militants, AP reported. Why it matters: "The group ... used its caliphate as a launchpad for attacks around the globe." The White House said: "The territory once held by ISIS in Syria and Iraq is now 100 percent liberated." The number of immigrants arrested or turned away at the southern border has continued to climb to levels not seen for years, according to new Department of Homeland Security data obtained by Axios' Stef Kight. Why it matters: The surge has been driven by an influx of migrant families and unaccompanied children, according to a DHS official. 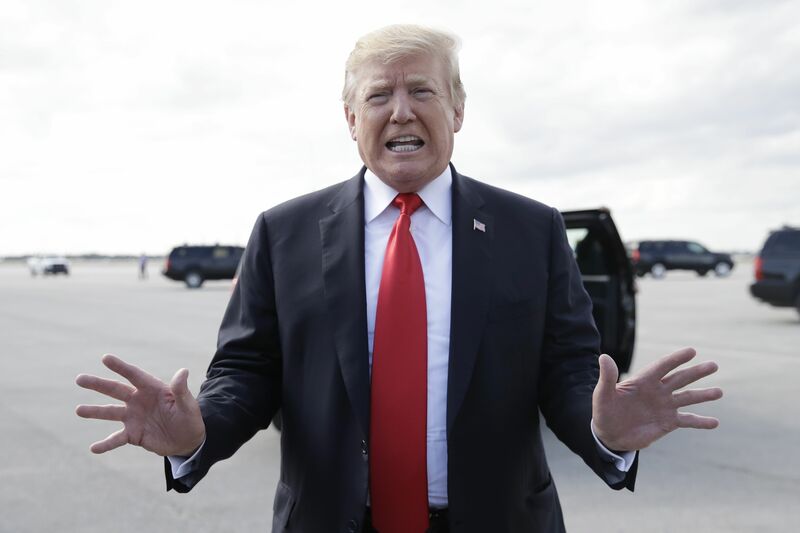 "At the moment, we have the closest thing to an open border that we've had," said Leon Fresco, an immigration attorney and member of a Homeland Security advisory committee formed by DHS Secretary Kirstjen Nielsen. Immigration and Customs Enforcement and Customs and Border Patrol have even begun releasing migrant families into the U.S. almost immediately instead of holding them in detention, Mark Morgan, former chief of Customs and Border Protection under Barack Obama, told Axios. "The apparent suicides of two Parkland school shooting survivors in one week underscore the need for increased mental health resources to help those still traumatized by the tragedy," the South Florida Sun-Sentinel writes. "News of both deaths spread quickly on social media, sending shock waves through a community that is still healing." 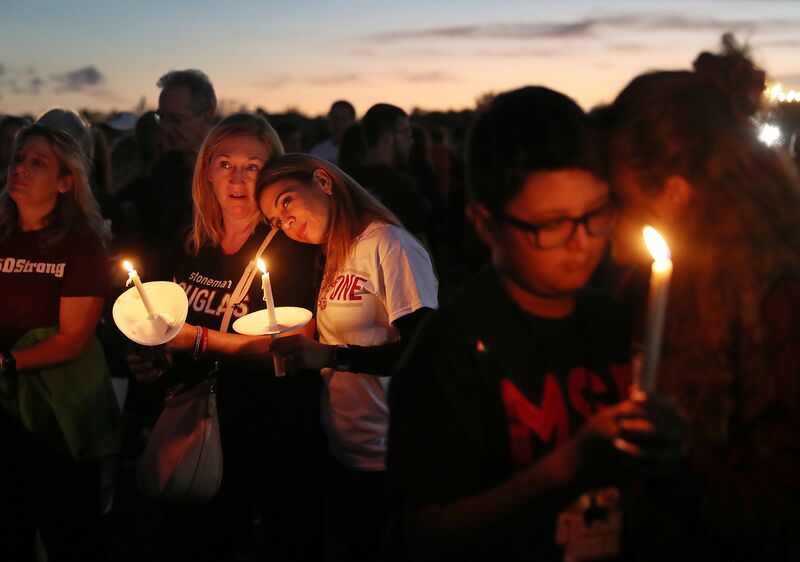 "Parents, students, school officials and other members of the Stoneman Douglas community met Sunday evening." "The group discussed the need for awareness and brainstormed what to ask their family and friends who are struggling and where to go for help." "Sydney Aiello, a senior at Stoneman Douglas last year, battled post-traumatic stress disorder. ... She died from suicide March 17. Her funeral was Friday." "The second student from Stoneman Douglas died Saturday night. ... He was a 17-year-old sophomore." Washington isn't known for nuance these days, but the lack of substance in the debate over the Green New Deal is extraordinary, Axios' Amy Harder writes in her "Harder Line" column. What will it really cost? Will it hurt poor people or help them? There's little substance to tell us. The Senate is set to hold a procedural vote this week to begin debating the Green New Deal. Democrats are expected to vote "present" to show unity and oppose Republicans’ efforts to highlight divisions on the left about the proposal. As final acts go, Gronk "gave us a great one, helping the Patriots to a third Super Bowl championship in five years." "As final catches go, the last one of [his] NFL career ... was pretty perfect too, representing so much of what made the lovable lug of a tight end such an integral part of the Patriots’ winning ways." "A beautiful study of a man who didn’t simply play the game as well as anybody who ever took the field, but loved it as much as any of them did too." "It was obvious every time he took the field."